I decided to start being upfront and write about what is working and what is not working in obtaining quality blog traffic and affiliate and or ad revenue from my WordPress websites. It is going to take some time to unwind exactly what I do and the methods I use; for this reason it will be written up over a series of blog posts. For those who enjoy reading my findings please tell me in the comment section some of your own discoveries in increasing traffic and revenue for your own sites. Hopefully these blog posts and articles will become more of a discussion as opposed to a one way discussion of my findings. For those who do not know me, I own several websites that some would consider blogs, publications, portals, industry niche websites, and industry directories. Whatever name you give to them does not matter to me, but what does is making revenue from them and a nice residual income. My revenue model is ads, mainly Google Adsense, Amazon Associate ads, and a few other affiliate programs. You might ask why I do not do sponsored posts because it is an excellent revenue source. The simple answer is I am very dyslexic which makes things difficult. For those who can do them there is great revenue that can be made from sponsored posts, so do not ignore doing them if you have great writing and grammatical skills. For those like myself who cannot, we just have to work harder and bring in much more website traffic to produce a living wage. You may be asking how I produce content for the sites if I am severely dyslexic. I use contributors, but not just any contributors. I make sure they are experts in the niche they write about. I never ever accept articles from SEO companies looking for a link for their clients unless the article is about SEO tactics for a site that focuses on SEO and the writer is a noted author discussing SEO strategies. I never accept articles from professional bloggers hired by companies to pump out articles containing often mundane and formulaic content unless the article is about blogging tips and is an above average article for a site that focuses on blogging advice. I do however seek out top notch experts to write about the niche in which they are experts for my various sites. For instance, VCs write about obtaining venture capital, and medical doctors who focus on specific chronic diseases write articles about that specific medical disease they research or are known for treating. Having experts writing for my sites gives them a lot of credit with Google and other search engines. If you do not use contributors, make sure you coin yourself as an expert in the area you blog about. Go beyond and take it several steps further making sure Google sees you in an expert in that arena. This is not done overnight but over time and with a lot of manual effort such as participating in forums focusing in that niche. Among other various tactics it helps to become friends with other experts in that niche on social media sites. Apache Error Logs – I cleaned up all the errors in my Apache Error Logs. I run my sites on couple Virtual Private Servers (VPSs). My hosting company has been on my back to deal with all the errors in my log for some time: over two years. I just ignored it thinking it if is an issue it will show up in Google Webmaster Tools, Bing Webmaster Tools or show some sort or error in the back end of WordPress or in Cpanel. For some reason my sites were slow, some performing badly in organic search, and my VPS started needing reboots at all hours. My hosting company basically gave me a stern warning fix the errors in the Apache Error Log or they are going to start charging me a hefty amount to reboot the VPS off hours or lose me as a customer. I did not even know where to find these error logs, it was not an obvious list in Cpanel, WordPress, Google, or Bing Webmaster Tools. I had to have the hosting company send them to me via email and guide me exactly where and how to view them. At first these error logs look like a foreign language, but I worked my way through to understand them and fix anything listed. Mostly they were pointing out badly coded plugins or outdated plugins that that were causing the server to perform badly. I deleted any plugin that was listed in the error logs and right away my sites ran faster and traffic increased. If I knew how much of a traffic increase I would have gotten from doing this, I would have done it long ago. I am also in my web hosting company’s good books for being proactive and fixing anything that shows up in the errors logs on a weekly basis. Mobile Friendly Responsive Design – I made sure my sites are mobile friendly. Time is a limited resource for me so if the WordPress theme was not mobile friendly I would change to a theme that was HTML5 compliant and responsive. It would have taken too much time to re-engineer an older existing theme to be mobile friendly. I tend to stick with StudioPress themes (Learn more – StudioPress Affiliate Link). I love them because they have excellent technical support, a forum, tutorial videos, documentations and email support. I also love how quickly they update their themes to meet industry standards as technology evolves. After trying many other themes from Themforest and Elegant Themes, I discovered that they look great but as technology changes and WordPress gets updated they seem to break, and the owners of the themes do not update them fast enough and become more of a headache than it is worth. Time is money, and choosing a theme that will produce the least amount of headaches as your site grows is well worth it. Adsense & Amazon Associates – I made sure that all my ads are mobile friendly and showing up when someone using a mobile device browses my sites. Twitter – I work on increasing my Twitter followers by following people who are influential and retweet in the specific niche my site and Twitter account focuses on. I did this about two years ago and then stopped doing this focusing on other areas because my Twitter accounts were growing on their own organically. However, lately I felt like I wanted to experiment again with this in the hope I gain followers who would have never heard of my sites otherwise. Across the board on all my Twitter accounts I went from 45,323 to 49,438 followers. Social Signals – I work on giving more proper social signals to Google to give the search engine a better understanding of what my site is about and what kind of followers are ideal for my site. This was done by joining and participating in groups in the specific niches of my sites on LinkedIn, Google+ and Facebook via each site’s profile page on that specific social media site. When I have time I take further steps to show that our contributors are experts to Google in the specific niche they are writing about by linking their social media accounts where they are prominent and their business websites. These small things give Google a full understanding of what industry the site is in and who are the ideal people they should show it to. Removed the Dead Weight – I removed sluggish elements from my sites. Periodically I run my site through a free site called GTMetrix.com to see what is slowing them down. Most often they are applications, plugins and ads that were calling out to a third party site. Social media plugins and ads are a major culprit for this. I kept the ads since they are my revenue and limited the use of social media plugins. Instead of having sharing buttons on the top and bottom of the site I only had them on the top of the site. Socialoomph Account Groups – I took a good look at Socialoomph (Learn More – Socialoomph Affiliate Link)) that I have a subscription to and have used for several years to see how I can utilize it better. I discovered Account Groups and made a few which I should have done long time ago. It saves me so much time when promoting my posts on FB, LinkedIn and Twitter. I was really was needing to free up my time. This simple step easily freed up one to two hours per day. Instagram – I worked on being more active and increased my followers in hopes the followers will read my bio where I list a few of my key sites and go to them. I am up to 845 followers. I know this is not much but I was a late adopter of Instagram. Link Building for SEO Purposes – I did not do any link building, in fact I have actually never done active link building. I am lost as to how to do it while still being ethical, so I stay away from it. I may be hurting my sites by not doing so, because some SEOs say that it still is important and it probably is, but I try to keep things as white hat as I can. I always adhere to Google Webmaster Best Practices where they say that forced link building is frowned on. Pinterest – Due to lack of time working on making my sites mobile friendly I did not do as much with Pinterest as in previous months. I do have it on my todo list in the next three weeks to clean up my Pinterest accounts and make them for efficient. I am a member of BoardBoaster ( Learn More BoardBoaster Affiliate Link) but I am not utilizing it to its full potential and would like too. I would also like to work on being a part of more collaborative boards. Collaborative boards rock and if you are not a part of any, go out your way to get invited to participate in some. Blog Commenting – I do not comment on other blogs to get links or traffic. There are many Facebook groups set up to do such a thing, “you comment on my site and I will comment on yours.” I just do not see the appeal in doing so and I feel that Google will see this as spam and will in future demote such sites that do if not already. Giveaways – I have never participated in giveaways for the use of increasing my social media following. It looks like it works well for some and they have a significantly larger social media following. I would be interested in learning from other bloggers during a giveaway; does ad revenue go up? If you liked what you read and learned some tips on how to increase your blog traffic and ad and or affiliate revenue I would love to hear some of your tips that made a difference in gaining quality traffic and affiliate revenue for your blogging sites. Recently, I have been taking a hard look at which Amazon Associates affiliate links, banners and widgets bring in the most revenue and which ones are just plain deadbeats wasting valuable space. Most of my readers/followers are aware I own several news sites based on a broad range of topics. Some might call them blogs, niche sites, online magazines, educational resources, etc. Amazon links are posted within almost all of them. I became an Amazon Associate back in 2003. It is 11 years later and I am still pleased with using the program. 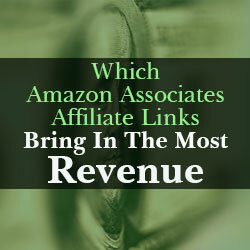 The goal of this post is to help you learn how to increase revenue by showing which Amazon Associates affiliate links, banners and widgets bring in the most revenue. I have learned from experience: Analyze, Analyze, Analyze! 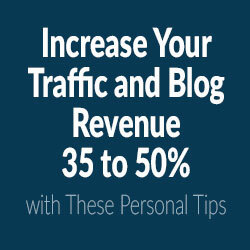 It will save you time and increase your cashflow when it comes to monetizing sites. I started my research by signing into my Amazon Associates account and looking at the Link-Type Report found under the Reporting section. I then chose a big date range, such as one year or many years, to get a large scope versus a day to day analyse. I ran three reports with different date ranges: 2003 – present day, 2011 – present day (In 2011, I changed my site strategy, due to the penguin algorithm) and a 30 day report. I then assessed Impressions and Click-Through Rate versus the Advertising Fee Column, mostly paying attention to the Click-Through Column to see the correlation between all three reports. Slide Show: The Slide Show widget so under performed, that it was embarrassing. It had the third most impressions out of all the amazon affiliate links, with a horrible click-through rate and minimal sales. It might be a cute widget, but it isn’t bringing me any income. It has to be removed from my sites. Banner Links – Category: Second most Impressions when it comes to Amazon affiliate links on my sites, with only a 4% click-through rate. It has a decent amount of sales for the 4% click-through rate. However, for the amount of impressions it should bring in more. The Banner Links Category features products chosen automatically based on product categories. The sales are good, but I can definitely swap these out for better performing units. Product Cloud: The Product Cloud widget shows clusters of product titles that are relevant to your page. The font size of the title in the cloud indicates how relevant the product is to your page. They look much like the old Tag Clouds in WordPress from years ago that were popular but not so common now because Google and other search engines see them as keyword stuffing. They get great impressions, ok click-through rates, but zero sales. Omakase Links: With tons of impression and a 52% click-through rate, Omakase grossly underperforms and brings me zero revenue. This actually shocked me because Omakase links combine information on each site visitor’s taste, the site’s content, and historical trends to dynamically generate relevant ads that Amazon serves to your site, providing personalized product ads to your site visitors. We have all seen these ads on sites. You go to Amazon two hours prior to research a product and then hours later you are on a random site and there is an ad for that exact product. I presumed the Omakase Links would be better revenue generators, but they are the exact opposite. Recommended Product Links: With a high impression rate, but only 4% click-through rate and zero in sales, I need to remove these ads immediately. I thought Recommended Product Links were a good thing because they are dynamic links in which Amazon automatically selects and serves the content. You enter the type of products you want displayed, and Amazon updates them with the best selling products based on your criteria. However, based on my site findings, they are not working. Easy Links: Getting decent impressions. However, with no click-throughs and no sales, this ad is not bringing in revenue and needs to be removed as well. Carousel Widget: The fancy carousel widget is eye catching, but it gets a low number of impressions, only a 6.3% click-through rate and no sales. It has to be removed. Deal Widgets: These display the hottest deals from Amazon on your web page. Call me greedy, but this widget isn’t a deal for me if it is not bringing in sales. With a good number of impressions, but no click-through rate, it isn’t working. I would opt for a better performing unit. My Favorites Widget: The name of the widget is self explanatory. I wish it performed but it doesn’t on my sites. It could be that I like boring things or it is not placed in a good location on my sites. Perhaps, it is just something people just don’t care to click on. Nevertheless, it needs to be swapped out for a better performing unit. Outside of these finding, the rest was really moot, not enough impressions versus click-throughs versus advertising fees to get any effective data from. I hope my findings will help you increase your revenue if you are an Amazon Associate. Feel free to share any tips you may have in the comments section below. When analyzing my Google Adsense performance, my Adsense performance reports clearly indicated which ad size, ad unit, ad type, and design were performing best and increasing my Adsense earnings. Below are my findings. Text ads and static images created the most cash flow whereas Animated Images, Rich Media, or Flash ads did not receive as many traffic clicks. In looking at Adsense text ads, and at my top performing sites and pages, I noticed that several sites that have ads with the vivid color difference on the site URL are clicked more frequently. As an example, on one of my top performing sites, The URL color is vivid red and it’s the only uniquely brightly lit red item on the page layout. Taking into consideration Google’s 2012 Panda layout algorithms, more than three ads on one side of the page can hurt your website ranking. Use only one or two ads above the fold. This gives the page layout a user friendly feel, as opposed to a MFA (Made For Adsense) site. The best performing placement for an ad is at the bottom of the content. Many website owners dream of living off the earnings from their website. Most who have this dream have tried and/or are using Google AdSense. Despite the fact that Google AdSense is known as one of easiest ways to earn revenue from a website, it is sometimes hard to convince your friends and family that with the right effort, niche and work, there is potential to make a good living. 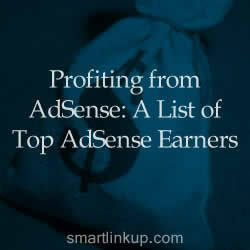 How much can someone earn from AdSense really? To be realistic, earning money from Adsense does not happen overnight or without making scarifies. Being knowledgeable about SEO, understanding best ad sizes and placement, having talent and time to write compelling original content, and having some knowledge of website coding increases your chances of optimizing your Adsense success. 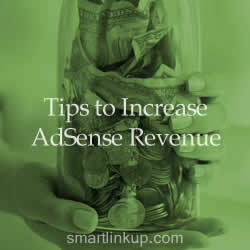 With smart work, however, you should be able to see AdSense revenue results. At first, it will be enough to cover the cost of hosting, but as your site grows and visitors are retained, the income could be a decent amount – even enough to quit that day job. Some publishers do get the formula right and we can study their sites for AdSense Tips. 1. Mashable – Mashable is the top earner of AdSense. Its monthly page view is about 25 million. Its monthly AdSense earnings are around $600,000. 2. Weblogs, Inc. – While no longer around, Weblogs, Inc.’s portfolio consisted of approximately 90 blogs. Their monthly page view was about 25 million. The AdSense revenue was on average $190,000 per month before getting acquired by AOL.com. 3. TechCrunch – Techcrunch’s monthly AdSense revenue is about $240,000. 4. Digg – Digg a social networking site, where people share and read news and other information. Its monthly AdSense revenue is about $250,000. 5. Perez Hilton – Perez Hilton’s founder Mario Lavandeirais is the top AdSense earner by blogging. Per blog earnings are around $200,000 per month. 6. Shoe Money – The founder of Shoe Money Jeremy Shoemaker earns about $140,000 from AdSense per month from various sites he owns. 7. Tweetmeme– Tweetmeme earns about $225,000 per month from AdSense with about 385,000 unique visitors per month. 8 . Plenty Of Fish – Plenty of Fish is a free dating site, which makes around $300,000 per month. 9. ClickIndia – ClickIndia earns $85,000 per month. They have around 5.5 million unique users a month. Please note all figures mentioned above are in USD.